For a few years now, white transitional kitchens have been ruling the design world, to the point that many high-end kitchens (not to mention interior design magazine spreads) have gotten yawn-inducingly similar. But as with this year’s pushback against white bathrooms, 2019 is definitely shaping up to be the year homeowners start to add a little personality to those white kitchens. While a lot of fundamentals this year are staying the same (L-shaped transitional kitchens with shaker-style cabinets and stainless steel appliances), the biggest kitchen trends this year involve adding colors, patterns, and little signature DIY touches to help set your kitchen apart from everyone else’s. 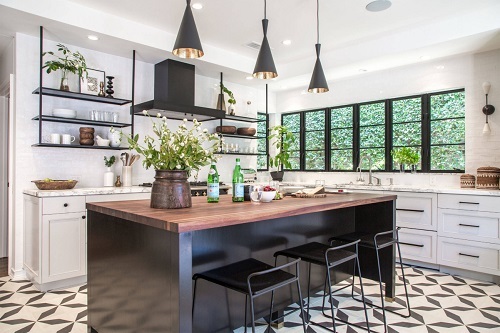 Tile backsplashes are getting a big glo-up this year. Now, I know as well as anyone that “add a tile backsplash!” has made just about every collection of kitchen design advice for the last five years at least, but in 2019 it’s go big or go home. Think full-height backsplashes that go from countertop to ceiling, either over your kitchen sink, above your stove, or both. 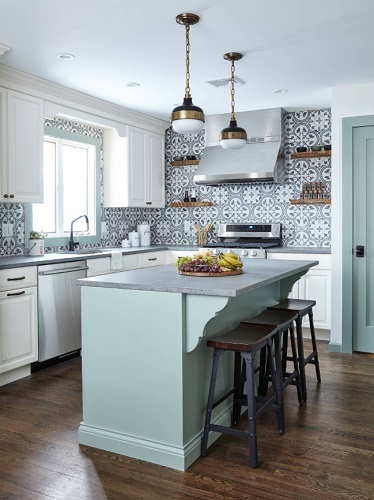 This not only gives you a huge canvas to work with (which makes it a great way to add color to a white kitchen), but also makes for a beautiful statement piece, especially if you opt for a graphic tile pattern or a tile medallion. Bonus if you show off even more tile by replacing your upper cabinets with open shelves. The biggest manifestation of the pushback against all-white decor is a huge uptick in the opposite direction: using black for everything from small accents to an overarching color scheme. Expect to see lots of white cabinets get repainted black this year, but even if you don’t quite feel bold enough to make that kind of commitment, adding black accents to your kitchen is a great way to give all that white a fresh new feel. Black paint is becoming a popular option in every room of the home, and because cabinets take up much of the wall real estate, it’s a low-stakes spot to try out this look. Otherwise? 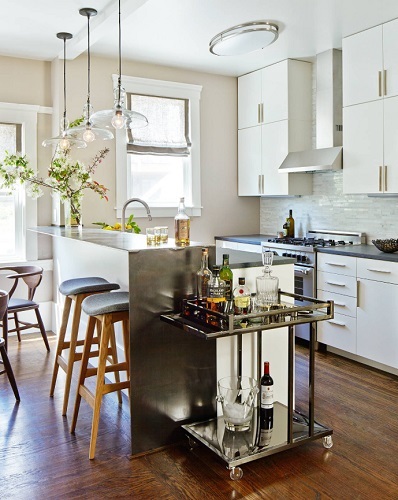 Think black upholstery, lighting fixtures, range hoods, bar stools, accent islands, window frames, grout or tile patterning, or even industrial-inspired iron hardware for those open shelves. Even just a little bit of contrast can make a big difference in a predominantly white kitchen. 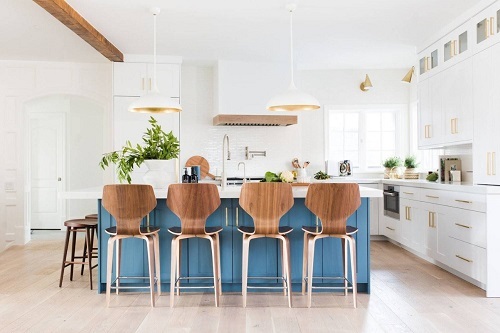 On the opposite end of the spectrum, 2019 kitchen trends are also showing a swing back towards classic farmhouse kitchens. 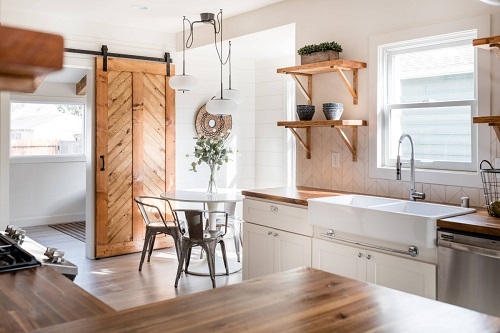 Rather than opting for the dramatic modern or industrial feel that adding black accents can create, the return to farmhouse kitchens is more about adding coziness and warmth to your space, typically with lots of wood accents and maybe a few vintage fixtures. But the goal here is largely the same: to take a white kitchen that feels bland and sterile and breathe new life into it. Think wood floors and butcher board countertops, reclaimed vintage farmhouse sinks, and classic lighting fixtures. Looking for a more dramatic change? This one’s for you. For the last few years, deck and patio design has been getting more elaborate and more involved, up to and often including full-fledged outdoor kitchens in place of a standard grill setup. 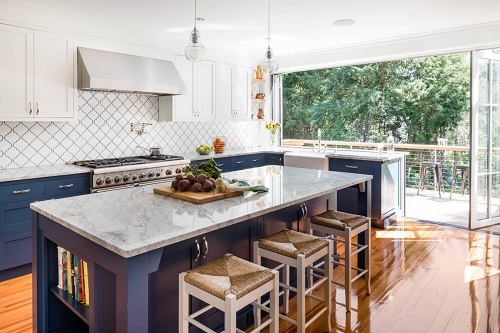 In 2019, we’re finally seeing a shift that I’ve been predicting for a while now: homeowners are starting to merge their indoor and outdoor kitchens and dining areas. Now, this has taken a while to become the new “it” thing because it’s certainly no small undertaking. At the very least, you want glass doors between your indoor kitchen and your deck, and better yet you want glass doors that can either be folded accordion style or removed entirely, leaving the inside of your home totally open to the deck beyond. Why bother? Even when they’re “closed,” these window walls offer spectacular views, and when they’re moved out of the way, it allows you a huge amount of space to entertain in, barrier-free. Of course, not all the 2019 kitchen trends involve huge-scale renovation. In fact, while a lot of white kitchens are getting re-imagined on a large scale, small DIY projects are really the big winners this year. One of my favorites is building a DIY banquette. We’ve seen a big resurgence of built-in banquettes and breakfast nooks in recent years, but booth seating can be prohibitively expensive to build. The alternative? Replace the built-in bench seating with a standalone upholstered bench or loveseat, paired with a freestanding table and chairs. I love this look because it’s not only more affordable, but it leaves you so much more room to express your personality in the process. Benches are available in an amazing array of fun fabrics and designs, so you can get a fun look without breaking the bank – and you’ll still end up with about the same amount of seating – and the same comfort level! Adding a bar cart to your kitchen or dining area is another great affordable, low-impact alternative to a large-scale construction project. Instead of building a full-service wet bar (which means dealing with cabinetry, plumbing, electrical wiring, and appliance installation), make a much more modest investment in a bar cart that matches your decor, then dress it up with your finest glassware and use it to display your liquor collection. While it might not chill your wine or give you a spot to wash your limes, it does turn a necessity (liquor storage) into a conversation-worthy accent. Bonus: most carts are on wheels, which makes it easy to bring your whole collection (and maybe a bucket of ice) to wherever it’s most convenient to entertain. It’s also worth noting that while many people are making big changes to try to update their white kitchens, there’s also one popular solution this year that’s both affordable and DIY friendly: repainting your kitchen island. If refacing your kitchen cabinets is beyond your budget or outside the scope of the remodel you want to do, updating your island instead is a much more manageable project (especially if it doesn’t have a lot of doors to remove!). So what color should you paint your island? Black is an easy choice and certainly in line with the trend towards high-contrast black and white kitchens, and gray is a good standby, but if you want something a little less stark, you’re in luck: the trendiest colors this year are bold emerald or teal, to add a big one-two punch of color to your space. If you’re feeling particularly adventurous, you could even tile your island to match your new graphic backsplash! 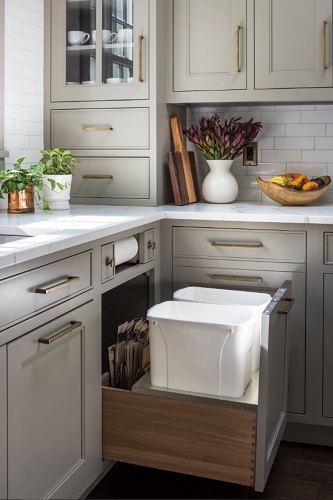 Last but certainly not least, the trend towards better, smarter, more personalized kitchen storage is forging ahead full steam – and if you haven’t jumped on that particular train, 2019 might be the time to give it a try. If you’ve ever given a side-eye to the growing trend of replacing upper cabinets with open shelves (or nothing at all!) and wondered how in the world people manage to store all their stuff without all that cabinet space, the answer is simple: making the cabinets you have work harder and smarter. Instead of a big cabinet with a single shelf, you want to add organizers that make it easier to access what you’re looking for – anything from pull-out shelves to pan racks to dividers that keep your sheet pans upright. There are some cabinet upgrades that take a lot of work (like adding tall, narrow pull-out shelves to the void space between your appliances, or upgrading cabinets to deep drawers), but most can be purchased individually and installed yourself, to fit the way you use your kitchen and make the absolute most of the space you have. 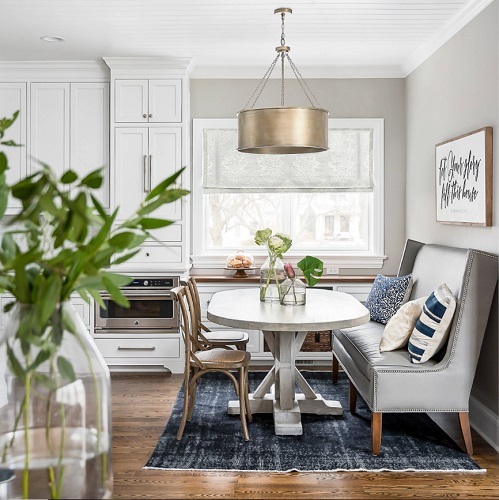 Often start-of-the-year design trends call for extensive renovation and total re-imaginings of whatever room they’re making recommendations for. But while most 2019 kitchen trends can be turned into a large-scale project, most of them strike me as very DIY-friendly – more about refining your kitchen to make it a more enjoyable and functional space to be in than totally rebuilding it from the ground up. So this year, if you’re looking for permission to start a fun weekend project in your kitchen, this is it! This entry was posted in Decorating Ideas and Tips, Kitchen, Kitchen Cabinets & Furniture, Latest Trends and tagged 2019 kitchen trends, black and white kitchens, DIY kitchen projects, Kitchen Design, kitchen trends.